The previous article showed you how to set up a Team Site blog and how to interact with it using the browser. This article will show you how to create and post blog articles using the latest version of Word. 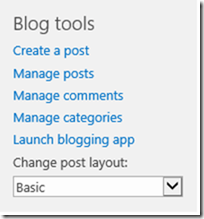 Navigate to your Team Site blog in SharePoint Online and then select Launch blogging app from the Blog tools on the right hand side. This will launch Word and prompt you to register the blog account. Press OK to continue. You should then receive a confirmation as above. You can now create your post with all the editing and formatting abilities that Word provides. When you are ready press the Publish button in the top left corner. You’ll then get a message that the post has been published. If you return to blog site and refresh the browser you should see your post. 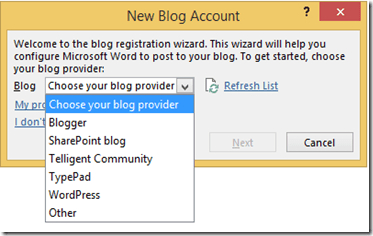 You may not be aware that you can use Word as a blog publishing tool for a variety of blogs. If you open Word on the desktop and then select the Blog Post template. You’ll then be prompted to register a blog account. Select Register Now. You’ll then be able to select the blog provider. 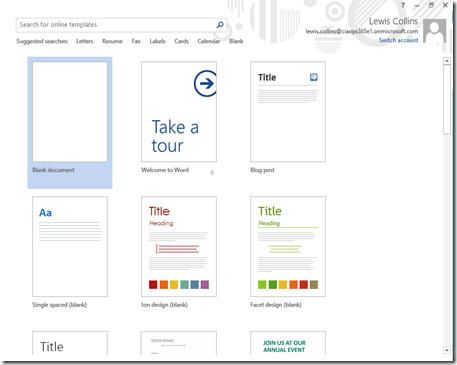 In this case select SharePoint blog and press Next. You’ll then be prompted to enter the URL of your SharePoint blog site, which is exactly the same at the top of this post, so everything from here will be identical. If you have already started a document and want to post that to a blog you simply select the Word backstage (via the File tab), then Share from the menu on the left and then Post to blog as shown above. Once you select the Post to Blog button on the right you’ll be taken through the same steps of registering the blog that you wish to publish to that has been detailed above. 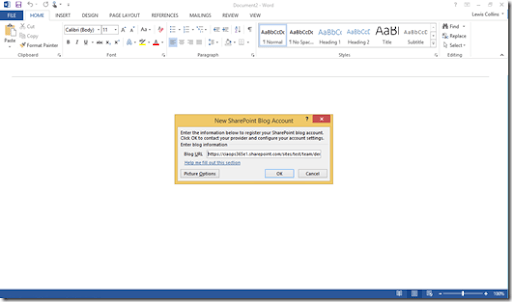 From what I can see, you can’t use Windows Live Writer to publish posts to SharePoint Online although you can use it with SharePoint Server on premise. This I believe is mainly around the authentication Office 365 uses. That is a little disappointing as Windows Live Writer is a handy tool for working with SharePoint blogs and is free. Hopefully, it may one day support SharePoint Online as I feel it would drive more adoption, especially with businesses who have never blogged before. Another thing to remember is that only the latest version of Word is supported as a blog editor on the Public Website.